Wendy is meant to be on a date with Scott, but does a runner with another guy. Scott comes in and tells Paul what happened with Wendy. He thought Wendy really liked him. Paul says it's best to act cool around women - Scott should ignore Wendy for a few days and then she'll come running(!) He says there's plenty more girls out there though. Danny and Wendy are having breakfast when the guy from the Coffee Shop rings. He tells her he's organised a taxi for her which will arrive at any minute. 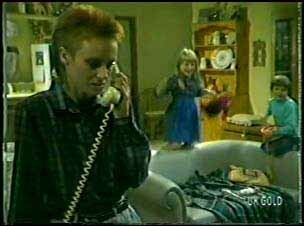 Wendy tells Maria that she's rung home and decided it's time she went home. Maria is confused - Wendy said she'd had a bad time at home. Just then Wendy's taxi arrives and coincidentally she's already packed her bags. Danny is not amused. Wendy says goodbye to Maria and Danny. As they walk out to the taxi, Maria tells Wendy to say hello to Anna for her. Wendy and Danny awkwardly say goodbye, then she asks Maria to lend her $10! Maria gives her the money. I think she realises she'll never see it again! Wendy tells Danny to say goodbye to Scott for her then gets in the taxi. Danny glowers. Danny tells Daphne and Maria that it's good riddance to Wendy. Maria is glad Wendy has gone - she was causing too much trouble for Danny and Scott. She doesn't believe Wendy has gone home though. Julie and Phil are just leaving the house. Apparently Loretta has broken the news to the kids about the divorce and is now refusing to let Phil see the. He looks very worried. Julie hugs him and tells him to try not to worry. Maria is vacuuming when Max comes in. Maria is not pleased to see him and tells him to ring before he comes round next time so she can be out. Max shouts that it's his house and he'll come round when he wants to. Maria insists she's entitled to her own privacy and Max has to knock on the door. She says if Max doesn't stop she'll change the locks and also she's sick of being his unpaid secretary. Max says it's hardly unpaid - he pays all the bills! They continue to shout at each other until Danny comes out and tells them to stop. Shane comes round to say hello. 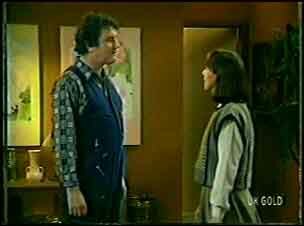 They chat about the bedsit and then Maria tells them about the row she had with Max. Shane thinks that Maria and Max should just talk to each other. Maria says she misses having Shane around, and he's always welcome to come home. She invites him to stay for tea, but Shane is going on a date. He takes some sheets with him. Maria looks very upset. Shane comes in with the sheets and tells Max that Maria is very upset. Max says he didn't start it - he only went to get some sheets and Maria got stuck into him. He says that Maria threatened to change the locks - he thinks the bloke she's seeing is a bad influence. Scott comes over with a bottle from Helen to give to Maria. Danny is cleaning a motorbike and gets in his way, so Scott drops the bottle and it smashes. They sit down to discuss Wendy and how she fleeced them both. Suddenly they decide to make up saying that women are nothing but trouble! When Des has rung off, Daphne looks interested in his evening's plans but he's tight-lipped. The bloke that Wendy went off with in the Coffee Shop (still no name supplied but from the credits I believe it is Tim!) It seems Daphne set Wendy up! Tim took Wendy to a disco, a band and then supper but she was awful - she didn't stop talking and was horrible to Scott. Tim says he didn't mind doing it for Daphne as she and Father Kevin were the only ones who have stuck by him. Tim wonders how long Wendy has been waiting for him at the station by now(!) Daphne says maybe Wendy will learn from being stood up herself and go back to her family. Des has arrived and the children are now calling him "Uncle Des". They are quite sweet kids and well-behaved. They all sit down, but Des suggests to the kids that they let their mother sit down and they all serve the dinner. The kids are pleased and enthusiastically start helping. Des says they can all go to the zoo on Saturday and come back to his place afterwards for some food. Julie has made Phil a lovely dessert and they are eating it by candlelight. Phil gets a bit serious and says that it'll be hard work for Julie when Debbie and Mike come to live with them. Julie says she doesn't mind - all she's ever wanted is a home of her own and a family. The kids have fallen asleep on Des. Joan and Des carry them off to their bedrooms. Julie and Phil are having a pash on the sofa. They are getting a bit passionate, but just then the telephone rings. 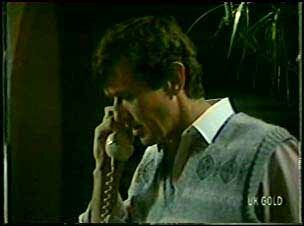 The person on the other end of the phone tell Phil that his daughter Debbie has tried to kill herself.